Sing it loud, sing it proud! We all remember the days of being singing along to our favorite songs and putting on a show. 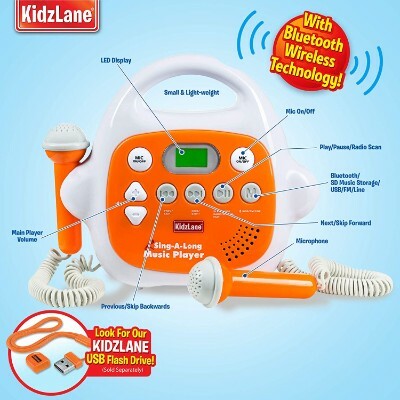 There’s no better way of getting your child involved in music then by gifting your child their very own karaoke machine. Music is a wonderful way to bring people together. Most of the time when parents remember karaoke machines, they remember a big clunky machine that takes up a lot of space. With the ones on our list below, parents won’t have to worry about that – most of the devices on our list are all handheld and can connect to any smart phone to play any of your family's favorite songs! Sing it loud, sing it proud. Karaoke machines are a wonderful way to bring the family together! We updated our top ten list making sure that all products were still available in the market today. We also converted this buying guide into our new layout. Some customers said that this machine is very ligth and didn't think that it would last long. 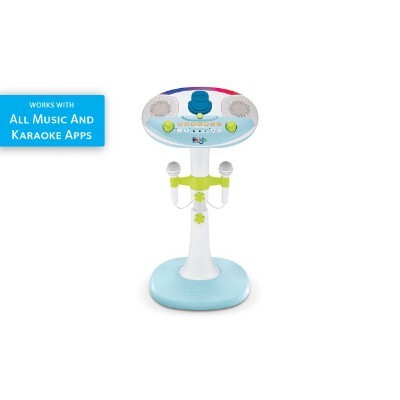 This childrens karaoke machine will grow with your little one. 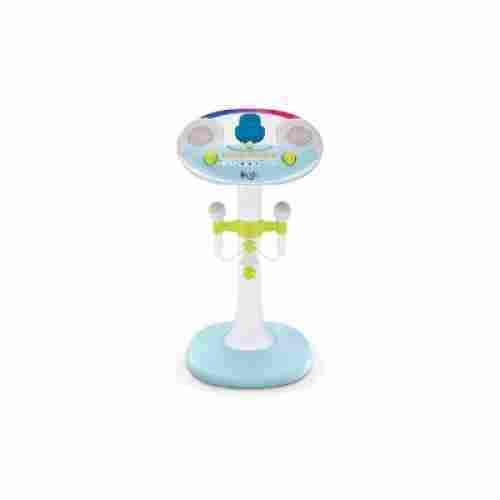 It does have an adjustable height feature and 6 different voice settings that your little one can explore. 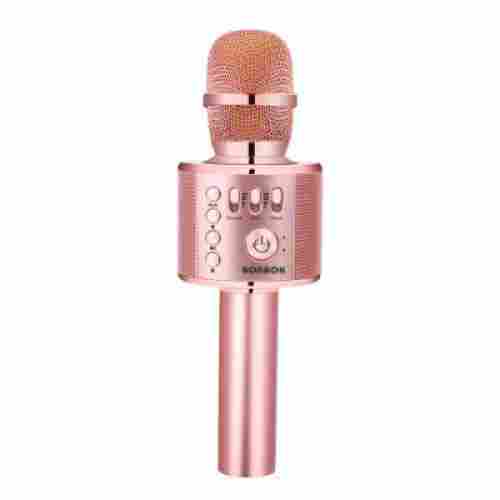 The microphone it's self also becomes unattached so that you can take your show on the road. It's the perfect companion for your litle star. 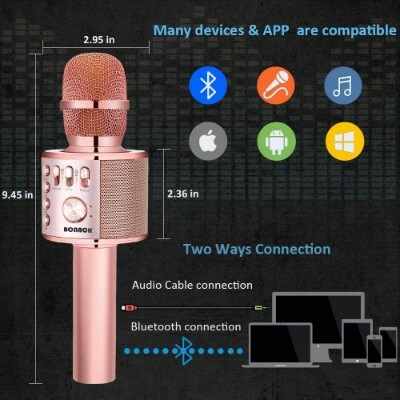 Unattachable feature that makes this microphone easy to travel with. Adjustable height where it will grow with your little one and last a long time. 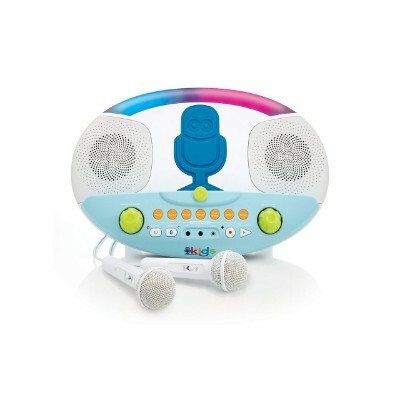 This device features 6 different voice features that your little one can explore with. 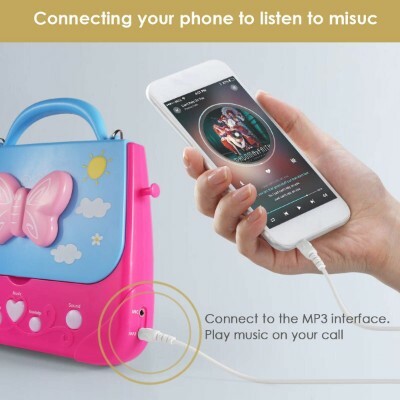 It can also connect to bluetooth so that your child can sing along to all of their favorite songs. With a built in memory, this device will let your child record all of their favorite performances. 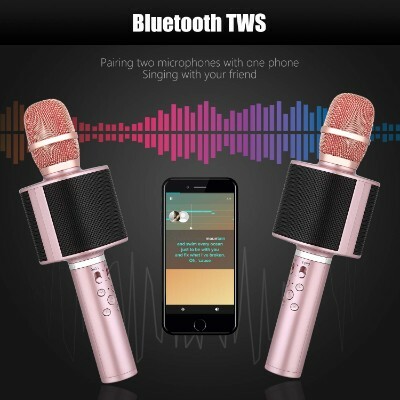 It features a microphone that is that allows them to sing along to the 10 different songs that are programmed and an AUX port with the cable that has been included. 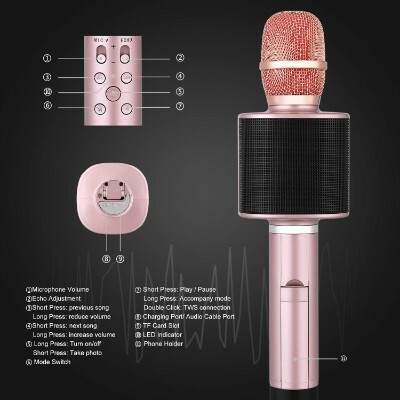 The microphone has an ON and OFF switch that allows users to turn it off and use the machine to listen to unlimited music. The light effects are an awesome addition to the already cute display on the front of the machine. Portable design allows kids to take it anywhere. So, let them get the on the go party started with this light up and go portable karaoke machine. The portability with this karaoke machine is great. It allows the kids to be able to take it any with them. Light effects are very cute. 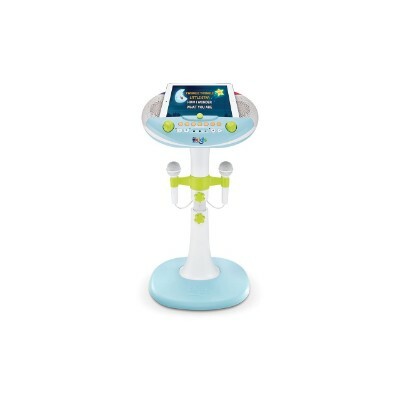 Lightweight, easy to carry around, and durable this karaoke machine has been designed with kids in mind. Karaoke machines build self-confidence. When children are able to express themselves in a positive outlet it builds self-confidence and helps build their self-esteem. When performing karaoke often it is in front of others allowing the child to reduce their shyness and in turn creates confidence. They create the ultimate setting for your little star to perform. 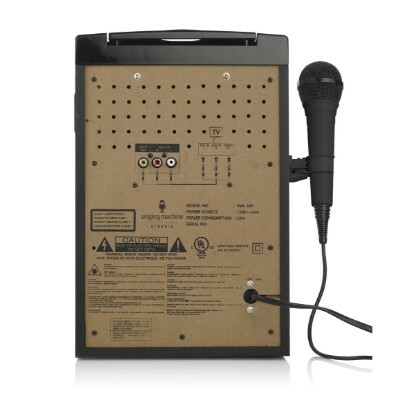 Some customers said that the microphone can give off static. 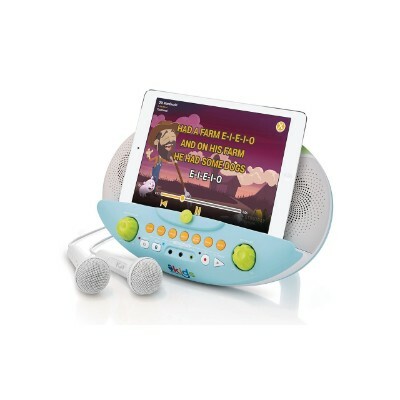 This device allows your child to connect their ipod with to play along their favorite songs. They'll be able to playback and record all of their preformances and remember them for a lifetime. There's also a feature where your child can add in sound effects making each performance extra special. 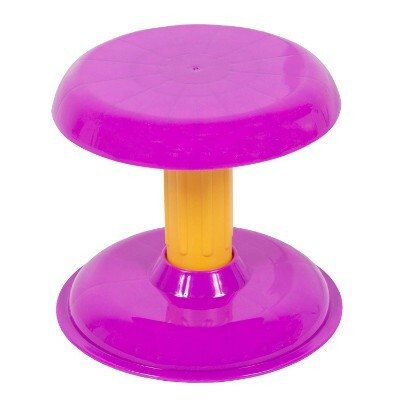 Can be detached from the table top. This device runs on 4 AA batteries. It's also recommended for children 4 to 9. 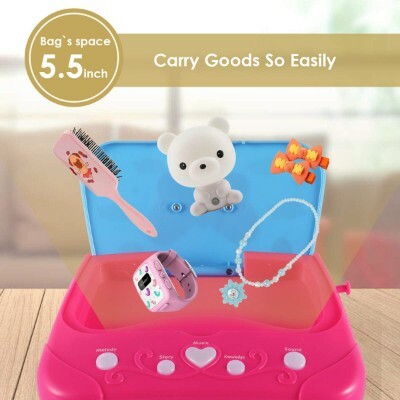 It does come with an adjustable height feature so that your little one will be able to grow with this. 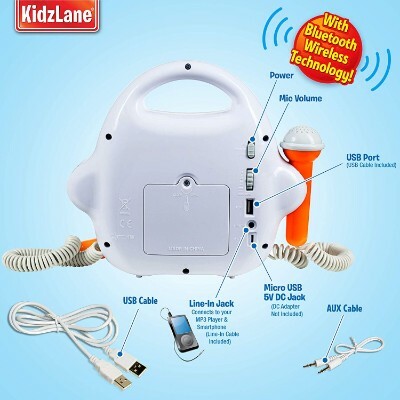 Your child can add sound effects and change the sound of their device with this built in microphone. It also comes with a disco light making each preformance have extra jazz. Your child will be able to record up to 5 minutes of each song that they choose. They'll also be able to playback their preformance. 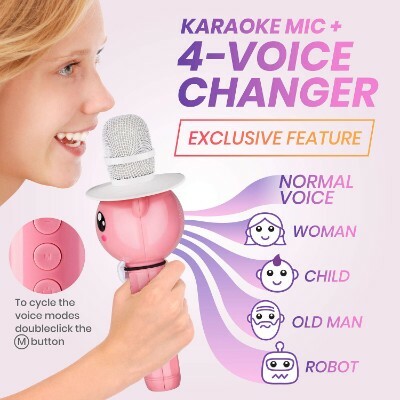 Not only is this awesome karaoke tool affordable, it also gives you up to six hours of continuous battery life, which means you and the kids can really let loose with nothing holding you back! It’s always a hit at birthday parties and other family gatherings. 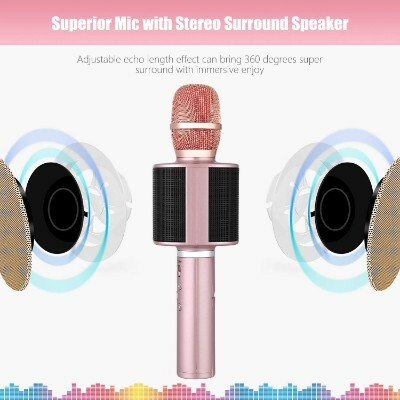 Because it’s both a microphone and a speaker, your kids can use it to listen to music once they tire themselves out from singing. A sleek design makes this extremely lightweight and easy to carry, while the five different muted color options don’t distract from your kids’ performance. By being able to sing along to their favorite songs at home, kids can learn about the power of their own voice and what makes them unique. Developing the voice at an early age is crucial for confidence later in life, and contributes to a child’s appreciation of music in all its forms. 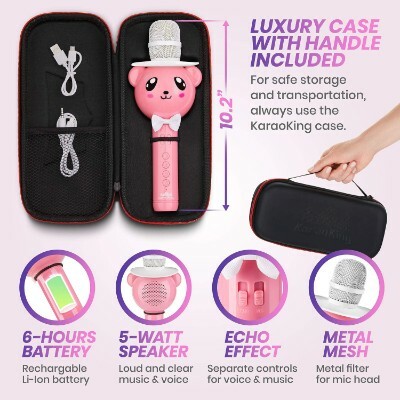 With over one-thousand customer reviews on Amazon, this snazzy karaoke machine offers your family hours of fun combined with the most technologically advanced design on the market. And with this one, it’s easier than ever to sing along to your favorite artists; simply put in your CDs in the top loader and sing to your heart’s content. This means that you and your kids have more control over the music choices and can create a more kid-friendly singing experience. It can be tucked discreetly out of the way so your little one can strut their stuff around the living room or stage, and it will never be in their way. It even comes with flashing disco lights in front that will liven up any party, whether it’s a birthday, church fundraiser, or school carnival! It’s important for kids to feel admired and loved, and one of the best ways they can experience that sensation is through “performing” for their family and friends. Kids love to feel like they can be the center of attention, and this fun singing machine will make them feel just that and more. Who isn’t a fan of karaoke? 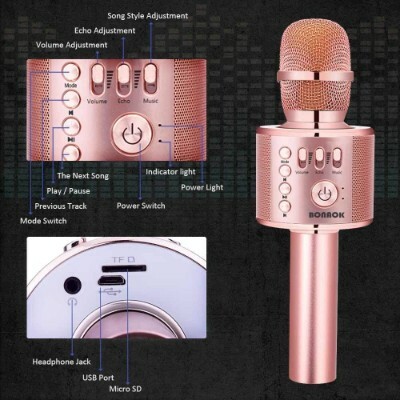 This KaraoKing’s kid-friendly microphone will take you back to the golden days. Your children will be able to sing along to all your favorite songs with this friendly bear. You don’t have to worry about the hassle of wires everywhere or clunky machines that you have to find a place to store while your child plays with other things. While this device is handheld it also connects to any smart phone and has a long-lasting charge so it’s perfect for any party. We know you and your family will love this device and all the tunes that come with it. 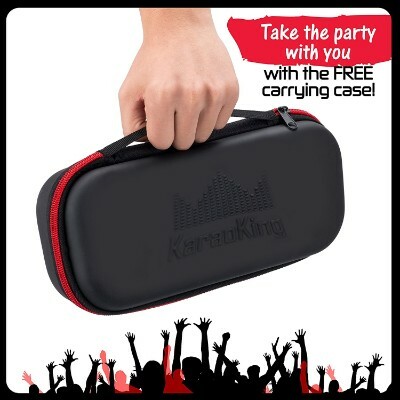 It’s also portable so it’s perfect for on the go and to bring to any of occasion! While it does have a rechargeable battery, battery life only runs up to 6 hours uncharged! 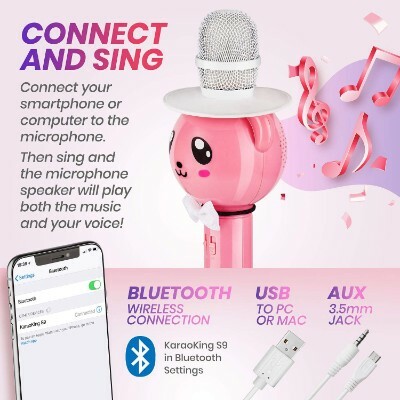 It also connects to any smart phone so if you get a little tired of any of the oldies that’s already preset, you’ll be able to sing along to any song with just a simple connection! This kid friendly device is easy to use and easy for children to grip. 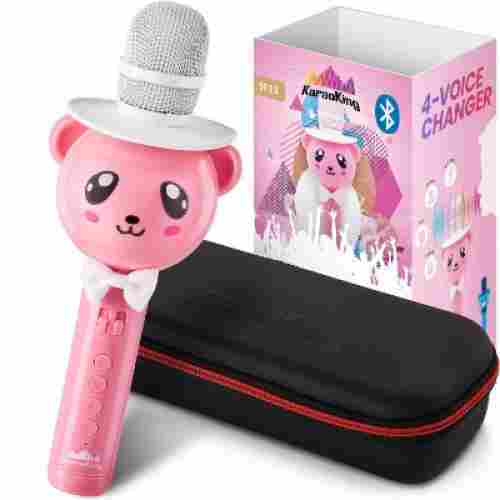 This device also comes with four different voice settings that you can choose from which can make each song extra special. Lights, phone, and action. 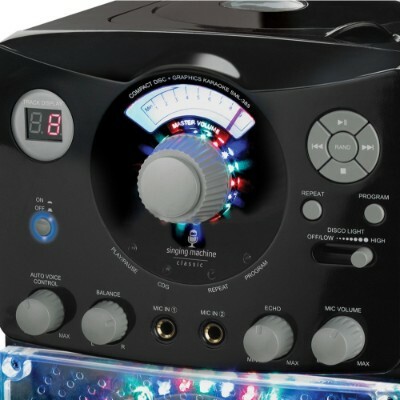 This karaoke machine is the future of all karaoke machines. The compact design with professional quality is unbeatable for the fun that this machine provides. 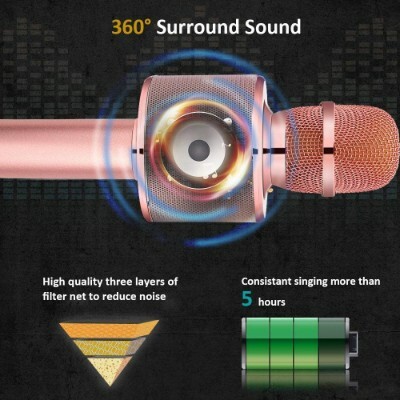 If the singer wants to sound like their favorite star it is easy with the metal filter that reduces noise and other interferences. The dual speakers are awesome at broadcasting the voice loud and clear to the audience. Get the party started with a battery life of over 8 hours. 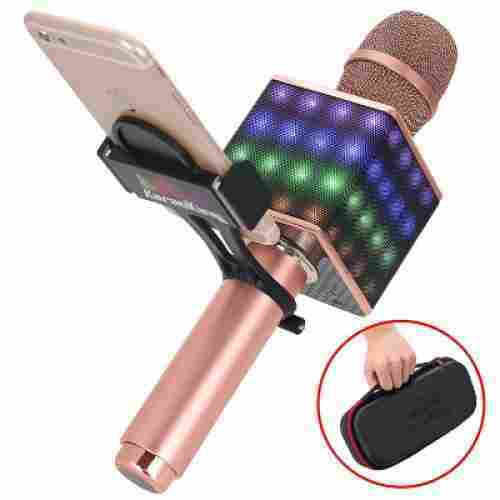 Plus the microphone even comes with a smartphone mount that is universal. 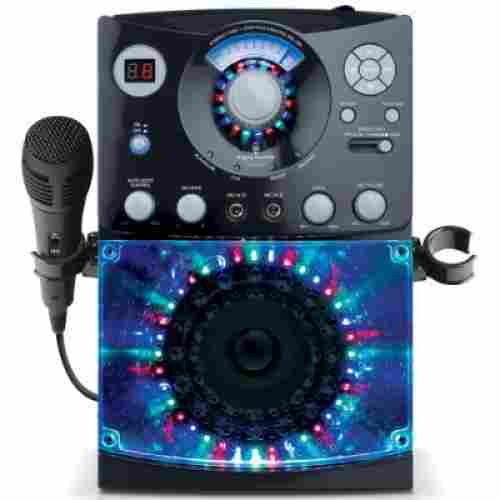 This portable karaoke machine is a great way to socialize and enjoy gathering with others. 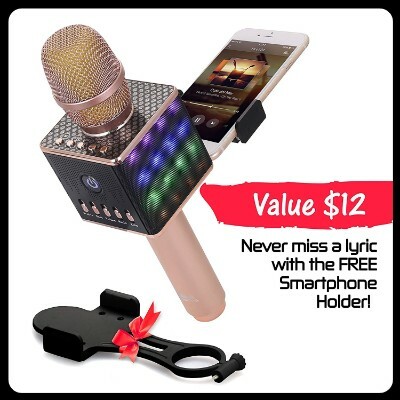 This allows the singer to be able to view the lyrics and sing along with ease. 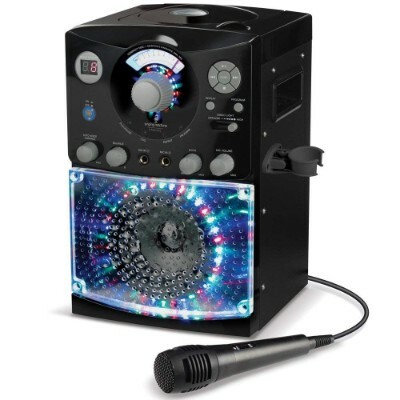 Taking the show on the road will never be the same after using this karaoke machine. It is the wave of the future. 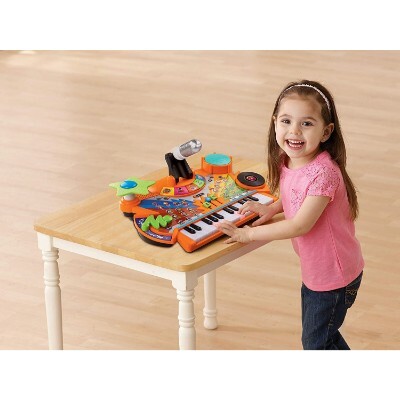 Designed especially for toddlers, this bright and colorful keyboard is the perfect introduction to musical instruments for young ones who are just starting to develop their musical talents. 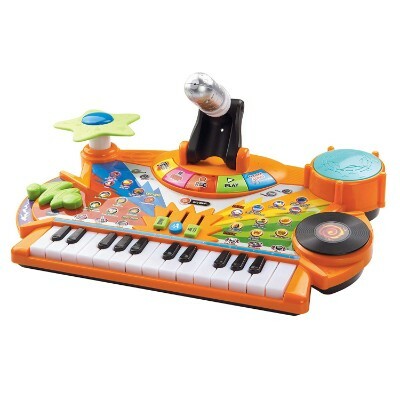 This toy comes with many of the most popular children’s songs, so your child can play along to familiar tunes. 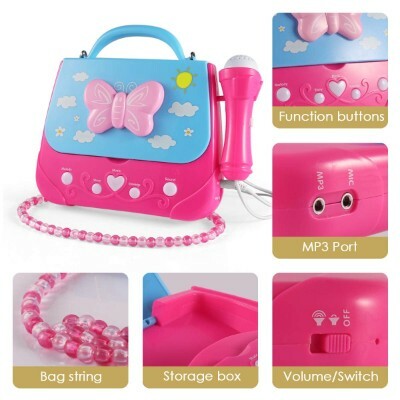 Impressively, it even comes with a real microphone so your kid can experience the real deal. It also lets them record and play their own voice, so they can learn and improve faster. Young children respond best at this stage to visual stimulus, which is why the fun visual buttons and keys on this toy are designed to make it easy for your toddler to differentiate between them. With so many different songs, rhythms, and instrument sounds to choose from, your toddler will be content for hours with this highly entertaining toy. Lively pictures and graphics help to guide your child through the different sound options, encouraging them to think creatively while having fun. 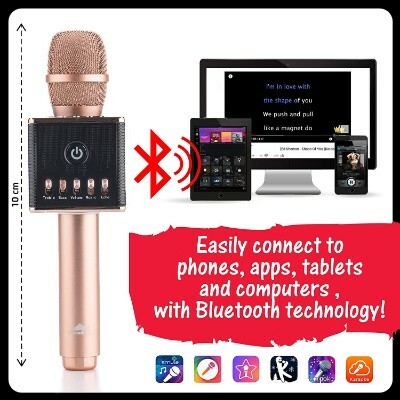 With technology always advancing in today’s world: it’s no wonder that this Bluetooth connection karaoke mic will allow you and your family sing any song that’s synched right from your phone! This handheld device is perfect for your future performer to put on a show whether it’s at home or on the go. One thing that's noticeable is with this handheld device your favorite tracks can actually convert into mp3 tracks with this device when plugged in to a USB port. 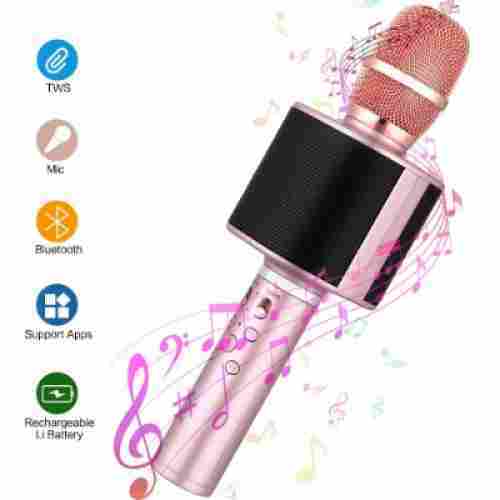 This karaoke mic allows you the ability to transfer any of the songs that your family sings where you may be able to create your own little karaoke family album memory. It’s the perfect gift for any occasion. It allows you to have the choice of singing along to some of the preset songs that’s already suggested from the device or you can pick your favorite and belt out those lyrics that you know so well. What makes this even more special is that this comes with multiple different settings that you’ll be able to fiddle with such as: volume adjusting, echo range, music selection and more! 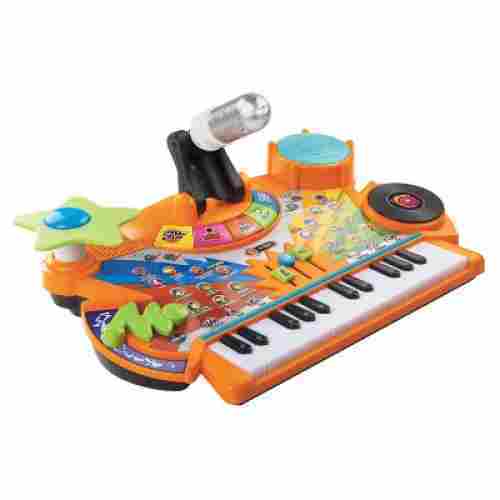 Give your child the very best of both worlds with this fully functional musical toy. 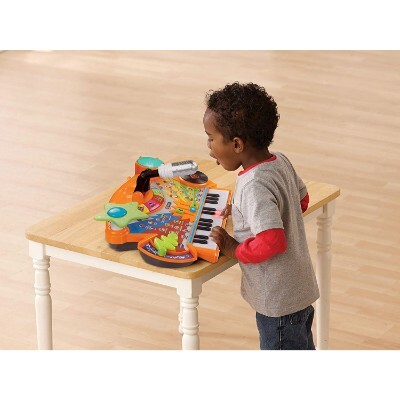 It comes with an astonishing thirty-seven piano keys that offer a wide range of sounds, and the microphone attached allows your child to sing while they play! 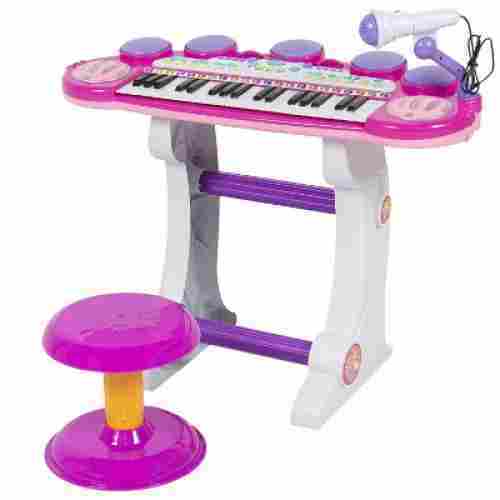 This keyboard and mic comes with a fully adjustable stool in a matching color scheme. 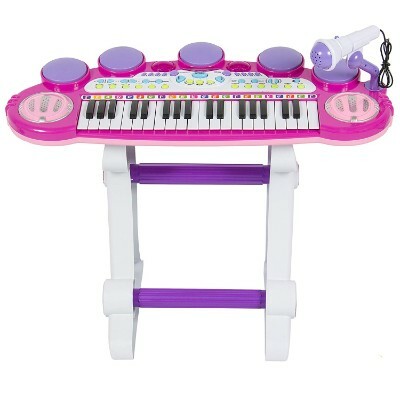 With a bright pink color scheme and a keyboard that lights up, they’ll never want to stop singing their little hearts out. 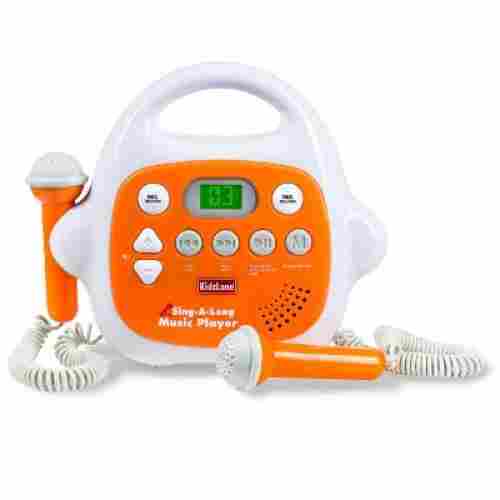 Children as young as three years old will delight in the multiple rhythms and music styles available, and the recording feature lets them listen to their own voice like a real musician! Once the list was constructed of the best karaoke machines for kids our panel of experts broke it down to the 10 best ones, based on features and developmental benefits. We want to make sure that any machine suggested by us is a fun experience that child to learn from as well. It is also important for them to have a great safety rating as well. So, the panels of experts select the best age-appropriate, quality machines that display the features and developmental benefits to be on our list. 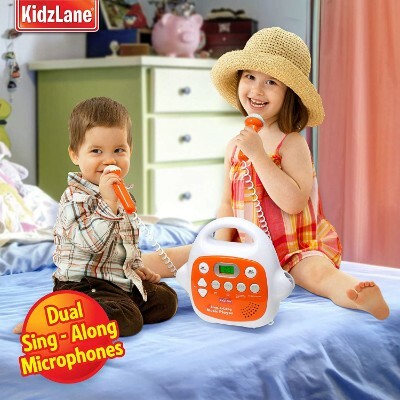 The karaoke machines that are picked for the 10 best karaoke machines for kids were a challenging task for our experts. We wanted to make sure that all the machines that were listed for designed for use for kids and not adults. Each of the machines was reviewed for their age rating and quality rating. 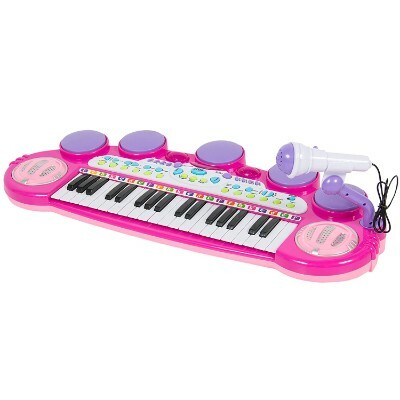 We did not want to suggest a karaoke machine that was age appropriate but was poor quality. Each machine had to fit both criteria before making the list. Karaoke machines build self-esteem and confidence by helping children learn to take center stage without building a complex about it. It allows children to build confidence through performing to their favorite song. Public speaking is considered one of the biggest fears of adults. When introduces karaoke machines at a young age it helps children become less fearful of speaking in public and creates a great confidence that allows them to take center stage without any sweating. Building self-esteem for a child can sometimes be hard. While others seem to just be born with it, some have to learn and build their self-esteem. Karaoke machines in a friendly environment can be a great tool for children.It allows them to feel confident and when you feel confident it builds their self-esteem right along with it. Encouraging children to have fun and learn a new song or perform one they just love is a great way to build confidence and self-esteem. Introducing karaoke machines at a young age helps build self-esteem by giving them a strong sense of their place in life. It allows children to connect with others through music and the experience of singing in front of others which builds self-esteem that cannot be taught. Karaoke machines are a great way to build confidence and self-esteem for children. When children use karaoke machines it helps with the development of many development skills. 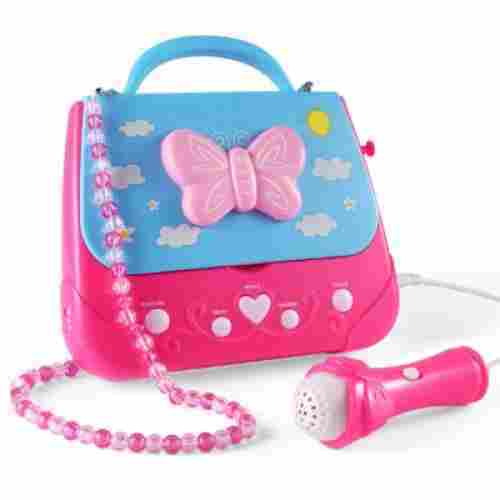 Children are using both gross and fine motor skills when using and performing with a karaoke machine. Using their gross and fine motor skills allows them to build of the level of skills that they have while also getting out their build up energy. Using gross motor skills to perform and fine motor skills to use the machine is a great way to help children encourage building both sets of developmental skills. Karaoke machines also help with cognitive developmental skills. They promote memory skills, visual learning skills, and even encourage children to learn how to read if they are not already doing so. All these skills are important and encouraging children to build those skills through the use of a karaoke machine is a fun way too. >Safety is also a primary concern since these are essentially devices that are made of electronic components. These also run on electricity or even rechargeable batteries. It is very important that these products are safe to use by our children. We had to look for indicators of quality and safety such as certifications from recognized quality control organizations. We also considered the experiences of consumers with these products. The more positive the customer reviews and feedbacks, the more confident we were in including the said product in our list. At least, we can always say that there are many parents out there who consider these products as great value for your money. Lastly, we considered the reputation or credibility of the company that made these karaoke machines. Some companies are just new in the industry and it would be quite unusual for us to trust a newbie over one that has been in the business for a significantly long time. However, if there are a lot of positive customer experiences related to the product, then the age of the company clearly doesn’t matter. There are many benefits of music to children, especially among babies. For starters, music has been shown to improve children’s cognitive development particularly the different learning processes in the brain. Exactly how this works is not fully understood, however. Nevertheless, existing literature shows that children who are exposed to music during the early stages of life grow up to become smarter and more intelligent compared to other children of the same age. Their intelligence is not the only aspect of their development that’s affected by music. It has been shown by numerous studies that music can also enhance children’s emotional intelligence. This enables children to be more attuned with their emotions making them better equipped to handle or manage emotional and social issues. When they grow up, they tend to be happier and feel more content about life in general than most kids. This can lead to fewer incidence of depression as well as other mood disorders. Children who are emotionally intelligent have a much happier and more positive disposition in life making them less threatened by social and emotional stresses. Music also helps facilitate social interactions by making them feel more confident about themselves. When children sing in front of an audience, they get to muster courage and help prevent stage fright or even social phobia. At least, you’ll be content knowing that your child will be able to mingle with any type of individual. q: Do all karaoke machines display music lyrics to the songs? No, all karaoke machines do not display the lyrics to the music. There are 4 types of karaoke machines on the market. Only the All-in-one System includes everything you need to display the music, hear the song and you singing, and CD player or audio input for the music. The other three types of machines on the market require either a TV to display the lyrics or a smart device. Make sure to do your research on the type of machine that features the things you would like. q: Where can I buy a karaoke machine in a store? You can buy a karaoke machine in almost any toy or department store. To make sure that you know what type of system you want and the features that you need make sure to do some research. Using our list to review the benefits along with the pros/cons is a good way to start. Then to find a certain machine in a store a search on the internet is usually a good place to start. q: Do children learn from karaoke machines? Yes, children do learn from karaoke machines. All types of machines are different and feature different types of learning experiences, but the base benefits from all karaoke machines are; improving cognitive development, allows them to express emotions, teaches how to read, builds vocabulary skills, and boosts gross and fine motor. It can also help prevent stage fright as an adult. Karaoke machines are a fun way to learn some great skills. q: Are all karaoke machines portable? Not all karaoke machines are portable. Different types of machines require different things. If you are looking for a portable machine look for an all-in-one machine that requires batteries. This would be a completely portable karaoke machine. Others require power from an outlet and many need a TV to display the lyrics. q: How do I know what karaoke machine is safe for a 4-year-old? Karaoke machines like toys all have safety rating for age appropriateness. So, not all karaoke machines are safe for a 4-year-old. Included within each of the items listed on our list is an age rating that is given to using by the manufacturer. It is important to make sure that the karaoke machine that you decide on it age appropriateness. To make sure that a karaoke machine is safe for a 4-year old please refer to each item. q: When is the best time to introduce music and singing to a child? It is never too early to introduce music and singing to a child. Music and singing are a big part of life for toddlers, so introducing them to songs as early as you can. Music is more than a form of entertainment for children it is also a learning experience. Music creates pathways within the brain that builds cells and creates the ability to learn more and more as life goes on. Music and singing is also a great way to bring friends and family together.